The term “animals” covers a lot of territory . . . especially when you consider the vastness of the Canyon. It includes more than just the mammals! Here is a bulleted list of the different types of “animals” that I’m likely to encounter. Of course, there are also many species (twenty-five) that are threatened or endangered. The Keep Wildlife Wild program could go a long way toward helping. Did you know . . . no one has ever found a fossilized reptile skeleton or even an entire reptile bone within the Grand Canyon. Fossil footprints were left by more than 20 species of reptiles and amphibians, but no complete teeth or bones! Grand Canyon National Park has attained world renown for its scenic vistas. Unfortunately, visibility can vary greatly (haze, smoke from forest fires, etc.). I’m hoping for “haze-free,” crystal-clear air (left half of the picture) as opposed to the alternative (right half of the picture) . . . time will tell! There are approximately 1,737 known species of vascular plants, 167 species of fungi, 64 species of moss, and 195 species of lichen found in Grand Canyon National Park. Wow! This variety of species can be attributed to an approximately 6,000 foot change in elevation from the North Rim (highest point) down to the river. Here’s a link to some interesting facts concerning the Canyon. Check out this link for more information on the Canyon plant life. In honor of my upcoming trip to the Grand Canyon, here is another wonderful feat of engineering that I can’t wait to visit first-hand. The Hualapai tribe of Arizona commissioned this horseshoe-shaped, glass walkway that opened above the Grand Canyon in 2007. The Skywalk juts off the rim of a side canyon 4,000 feet above the Colorado River. Despite the vertigo-inducing views, the glass bridge reportedly is very sturdy — it can support more than 71,000 pounds and can withstand gusts of wind over 100 mph. But I’d hate to be the one that pushes the limit past 71,000 pounds. I am really fortunate to have that unique combination of “adrenaline junkie” plus “no fear of heights” . . . the view has got to be amazing! While I’m planning on hiking my way in to and out of the Grand Canyon, there are definitely other methods for getting there. I may even want to try running in and/or out of the canyon on a subesquent trip. Another common option: hop aboard a sure-footed mule! If this sounds like fun, plan ahead (more than a year in advance — reservations fill up fast). However, there are restrictions: overnight mule riders must not weigh more than 200 lbs/91 kg fully dressed. 3-hour Abyss Overlook riders must not weigh more than 225 lbs/102 kg. Riders must be at least 4 feet 7 inches/140 cm in height and must be able to speak and understand fluent English, must be in good physical condition, should not be afraid of heights or large animals, and cannot be pregnant. Of course, if you are seeking more adventure, you could fly over/in to the Canyon like Yves Rossy did! This would definitely be a unique experience . . . I imagine that the views would be awesome. Here’s a link to a video of the flight. You may even want to consider arriving at the canyon by train. The Grand Canyon Railway sounds like a wonderful scenic excursion as well. In a book I was reading last week, I encountered a new word . . .
1. the largest Eurasian bird of prey, Gypaëtus barbatus (bearded vulture), ranging in the mountains from southern europe to china, having a wingspread of 9 to 10 feet (2.7 to 3 meters) and black feathers hanging from below the bill like a mustache. And, while I will probably not encounter one of these magnificent birds of prey any time soon, I was able to catch a glimpse of an Andean Condor during a trip to Chile several years ago, and I hope to catch a glimpse of the California Condor while I’m at the Grand Canyon this year. The Gun-Carryin’ Librarian blog celebrates its third anniversary today! It has been a wonderful journey (that will hopefully continue) despite the occasionally frantic moments of despair and panic when writer’s block rears its ugly head . . . or on those days when I really do not have a good idea on what to post. But so far, I’ve always managed to get something posted. Here are the hard, cold numbers . . . Allow me to express a big “Thank You!” to all of my faithful followers and visitors. Here is a superb panoramic view of the Grand Canyon! I can’t wait to see it in person . . . I don’t normally take a lot of photographs when I travel, but I may have to make a more concerted effort this time around. I have my compact digital camera (Sony CyberShot, 14.1 mega pixels), a spare lithium ion battery, and an 8-gigabyte memory card. I’m thinking this should be sufficient for my purposes. Today marks the beginning of a series of posts on the Grand Canyon to help “psyche me up” in preparation for my vacation there this year. Our plan: drive to the South Rim, take the shuttle around to the North Rim, hike down the North Rim (halfway the first day . . . camping under the stars), get to the bottom, spend a few days at the bottom taking advantage of some exploratory day hikes, then hike out the South Rim before slowing working our way back to Tulsa. It’s going to be awesome! 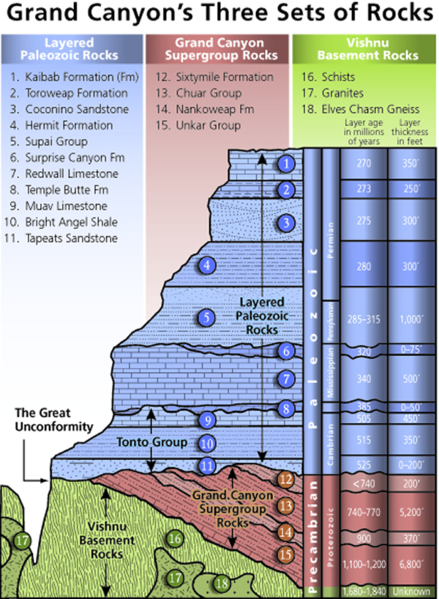 Here is a wonderful chart that shows all of the “layers” of the Grand Canyon (click on the image for a larger view). Today marks the summer solstice (the day of the year with the longest hours of daylight) in the northern hemisphere and the winter solstice (day of the year with the shortest hours of daylight) in the southern hemisphere. The summer solstice occurs exactly when the Earth’s axial tilt is most inclined towards the sun at its maximum of 23° 26′. And, while it is generally an “instant in time,” the term is used to refer to the day in which it occurs. This year this “instant” occurs at 17:16 hours (5:16 PM UTC [Universal Time, Coordinated]). The above quincunx will serve to illustrate the Earth’s relative position to the sun. 1. an arrangement of five objects, as trees, in a square or rectangle, one at each corner and one in the middle. 2. Botany. an overlapping arrangement of five petals or leaves, in which two are interior, two are exterior, and one is partly interior and partly exterior.